A group of Sanskrit teachers from the Sanskrit Bharati organization came to the ashram for a 7-day retreat. Most of them are from the Uttar Anchal or northwestern Uttar Pradesh. They are trainers who are preparing other teachers who will lead 18-month Gita study groups to be given to graduates of the basic their spoken Sanskrit course and starting later this year. I was told that this course will be given in 10,000 locations in 16 countries. The purpose is to familiarize students with the Gita as well as to deepen their knowledge of grammar and vocabulary. This is a picture of Chandramani Acharya, who was trained up at the same Arya Samaj school that Sanjay Shastri went to, Prabhat Ashram near Meerut. A pretty nice place by the looks of it, where everything is conducted in Sanskrit. Children who join the school are obliged to speak Sanskrit or miss a meal. It is learn or starve. They also do things like recite Panini's sutras while in a headstand and other memorization feats. Chandramani is now the Gurukula's head teacher. And quite deservedly so. Here he is welcoming the Sanskrit Bharati group. 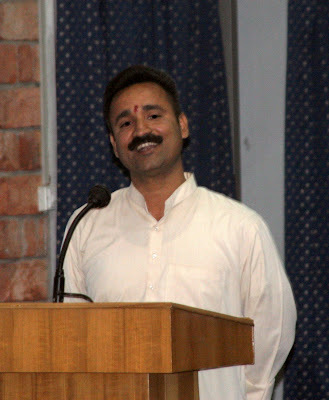 This is Dr. Sanjiva Kumar, the leader of the Sanskrit Bharati group. 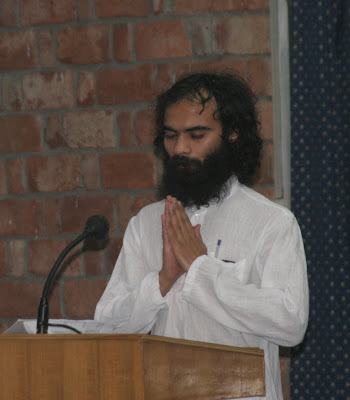 They have been giving a basic course in spoken Sanskrit to the Gurukula students who wish to attend. Unfortunately, that group has dwindled to only a handful. Dr. Sanjiva is very charismatic and very good at what he does. I asked him what their relationship with RSS and VHP is (besides that they all sit in orderly rows), and he was open in stating that they have the same philosophical goal of advancing pride in India and its culture, as well as helping it progress, etc. 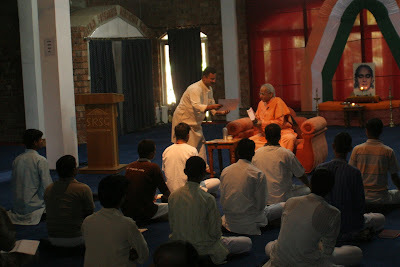 Here Dr. Sanjiva is giving a set of the Gita books to be used in the above-mentioned course to Swami Veda. 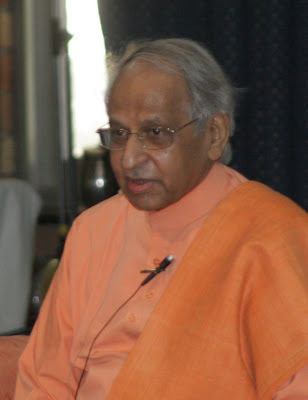 Swami Veda addressed the group in Sanskrit, but due to general poor health and fatigue has not been giving the regular classes he originally intended to. I gave one class to the group in Sanskrit on the five pillars of sadhana. As mentioned on my other blog, that has inspired me to go into silence for a week before leaving for Canada. My intention is to be back here in September, unless something else comes up. I should write this up in Sanskrit, but I probably won't have the time. It is wonderful to know that there are caps organised to teac spoken Sanskrit. Will you be conducting / organising such camps in Canada too? I truly believe Jagat should organize camps to teach more people speak the language of (manjari) bhava. That's true dying language, one worth preserving. And guess what; for speaking it even slightly, you won't need a breakfast. It's so self-fulfilling. Thats a tradition worth preserving. I dream of a lila where breakfast is unlimited. To make samskrit a spoken language is a true service of Bharat Mata. i love Sanskrit and really proud of Sanskrit bharti. neckless as white as moon or flowers. He is rather beautified by his cultured voice. The jewel of voice is the real jewel. All other jewelery gets weared.